My Mason Bee house (48 tubes) arrived today and was installed in a prepared weather proof enclosure namely a five gallon pail, and placed in a shaded tree. The house was supplied by Crown Bees on the internet. A small container of flexible garden clay was also placed in the enclosure. Cost around $60.00. There are few bees in my extensive garden and my aim is to attract some mason bees. At the present time it is an experiment. 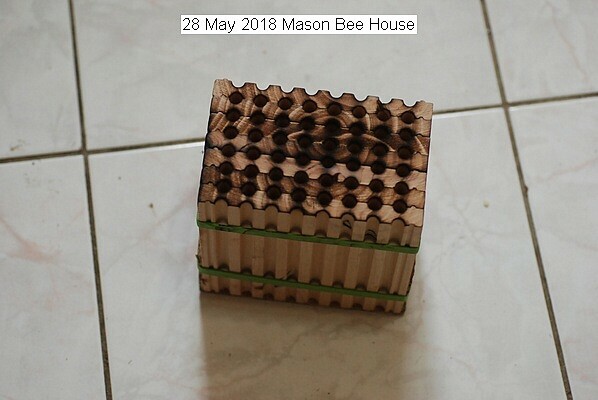 This entry was posted in Uncategorized and tagged 28 May 2018 Mason Bee House, Mason Bee House. Bookmark the permalink.